Do you remember your first independent experience in an ‘adult’ restaurant? I do! We had just entered college and were all of 16 years. The only places we frequented were small cafés or coffee shops or South Indian restaurants. That’s pretty much all we could afford with our meagre pocket money. 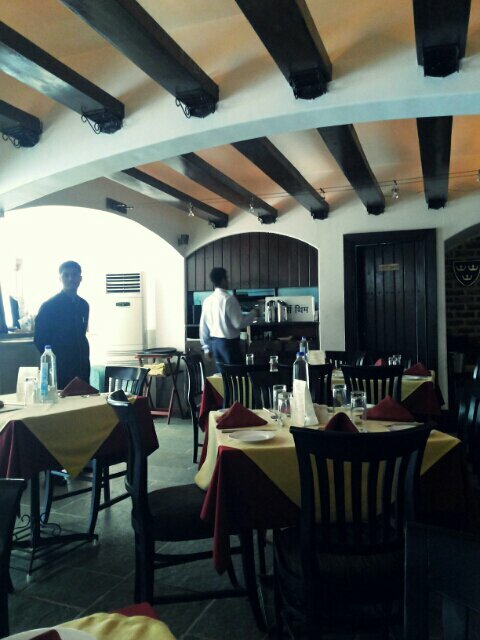 But then, someone heard of this really good European restaurant in the ultra fashionable Koregaon Park neighborhood. We decided to go there but had to plan. We would have to save for a few weeks to be able to enjoy a good meal. So, we decided on a date, 9 weeks from now which was enough time for us to save up. We were 10 people. 10 very excited people! The day arrived. We got dressed up. The girls put on some make up. We split into groups of two and got on our bikes. We reached in time for lunch and were greeted by the very well air conditioned air. The restaurant is some what dark and dimly lit. Lots of wood. We suddenly were aware that we are kids alone in an adult restaurant. Such a wonderful, exciting feeling! Its these small experiences that slowly mould your personality as you grow up. But coming back, we all settled on our orders and were completely bowled over by the food! Such beautiful flavors! Their food presentation was a unique experience. It was still a new concept then but now restaurants have realised the value of good presentation. Moving to present day, I still order only the same thing. I have come here maybe 25 times over the year but I love what I order so much I refuse to think of trying anything else. My favorite thing to order here is “Ferdinand”. I wouldn’t dream of thinking about ordering anything else. I might try something different from someone else’s plate, but this is what I’m most satisfied with. Last week I was back in Pune to surprise my mom on her birthday. We also had some relatives who had joined us and were keen to try something different. We decided to head to Arthur’s for a nice lunch. The ambience has stayed the same yet, it doesn’t feel old. Lots of dark wood with a stone flooring and three large room air conditioners. The air conditioners are awesome because even in peak summer, the restaurant stays perfectly cool and comfortable. We took a nice table and settled in to check the menu out. For first time visitors, you will find it odd that all the dishes are named after Kings and Queens but thats just the theme of the restaurant. I love that they have descriptions about all the food and they can make anyone feel hungry!! We started off with the onion rings and a French onion soup. The onion rings were crisp and dipped in a lightly flavoured batter. They didn’t seem oily to eat but I was disappointed that they served it with ketchup. A nice paprika dip would have made it more exciting. The French onion soup is almost like a clear soup and is very different from French onion soups elsewhere. Its packed with flavour and is wonderfully light. A good soup to begin your meal because it isn’t very heavy on your stomach. Arthur’s Theme serves a basket of warmed bread rolls at your table and they’re wonderfully fresh. 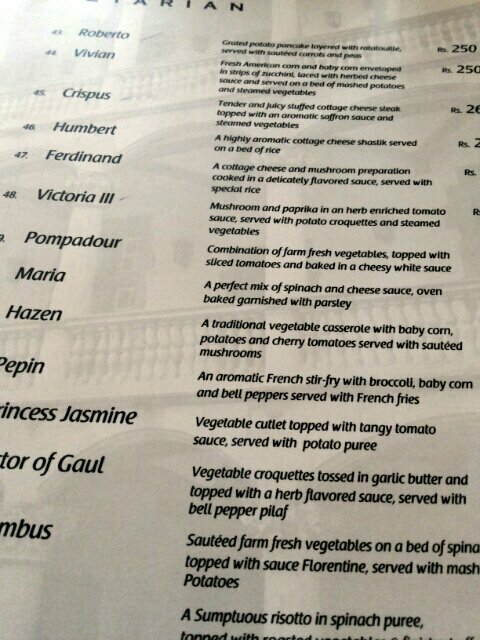 For mains, we ordered Princess Jasmine, Ferdinand and a paneer shashlik. My mom’s favorite is the Princess Jasmine which is basically two vegetarian cutlets served with a red sauce on a bed of potato mash. 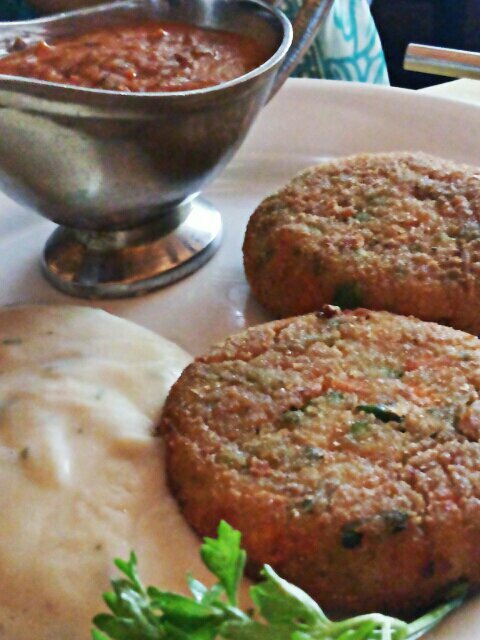 The cutlets are quite hearty, seasoned well and cooked to a crisp on the outside. The tomato sauce that comes with it is quite tangy and flavored with herbs. The sauce is a little too tangy for me and I would have preferred it if it were a little less sour. The potato mash was smooth and complemented the sauce well. 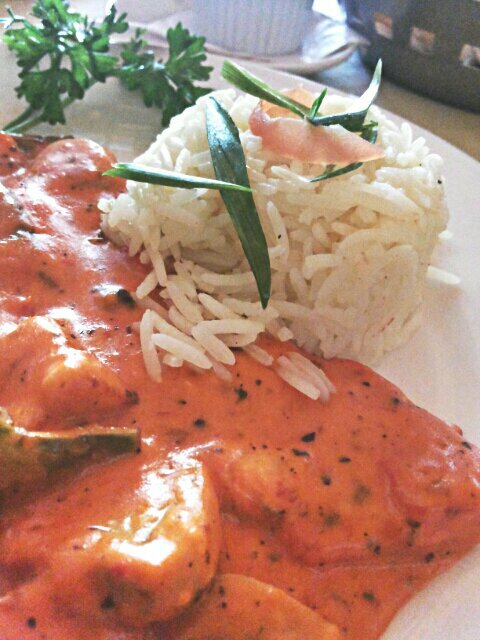 The paneer shashlik comes on a bed of herbed rice and is covered with a tomato sauce. I think the tomato sauce of the cutlets and the shashlik is quite similar. 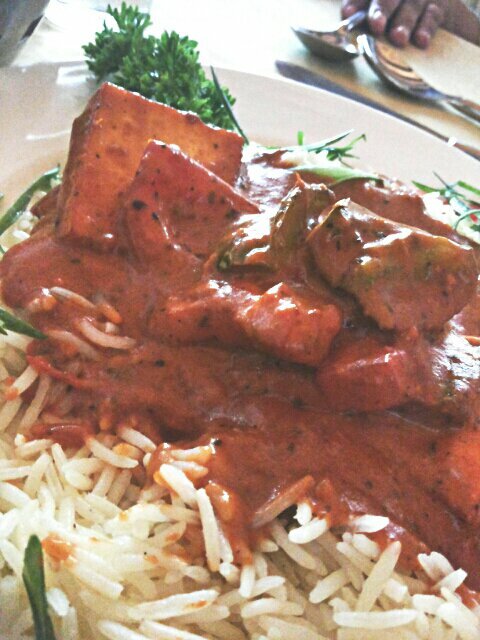 The paneer was slightly chewy but not a lot to complain about. All in all, the dish tasted quite nice and the flavours worked well together. Ferdinand is grilled capsicum, tomatoes, mushrooms and paneer in a beautiful orange gravy. It comes with a side of herbed rice. The sauce is creamy and explodes of beautiful herbs dancing on your tongue. I have tried so hard to think how the sauce could be made and all I have come up with is that it has a light tomato base and cream in it. Its not spicy at all yet you don’t miss any of it. Arthur’s Theme has some of the best staff in tge city. They are polite, courteous and attentive. I can’t stress the importance of having such servers and how they can make or break your restaurant. It also helps that someone is always behind the counter. I have never had any reason to complain but I’m sure they would handle all criticism extremely well. The prices have gone up from when I remember them, but it’s still quite reasonable for such good food. For providing me with beautiful memories (its also the first place that S and I went to when he came to visit me in Pune) consistently good food, introducing me to new delicious fusion cuisine and for maintaining good service, I give Arthur’s Theme a 4.5/5.